The floor can actually be the centerpiece of your bathroom, so choosing the right material and pattern is important for the space. There are many materials that can be used in modern bathroom design, but tile still seems to be the flooring of choice. Natural stone or materials that mimic it are popular, along with porcelain. 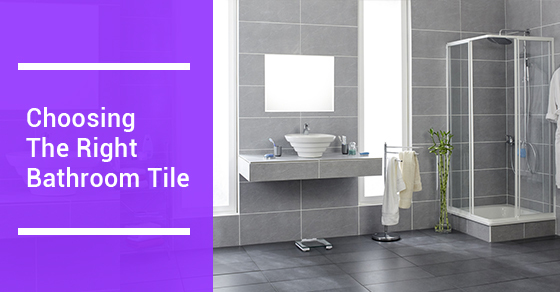 Larger tiles also seem to be chosen for bathrooms more often than smaller ones. Floor tiles made of ceramic usually have more texture to them than those used on walls. The texture is chiefly used to prevent you from slipping. Natural, honed stone will also give you a good grip on wet surfaces. You wouldn’t think a wood floor would be ideal for a bathroom, but if it’s properly sealed, a hardwood floor can be lovely, safe, and impart a natural look to the bathroom space. Vinyl can also be used. It is a cost-friendly alternative and it is easy to take care of. A soft pile carpet is not recommended for a bathroom, but carpet that can withstand moisture and is resistant to mildew works. There are even carpet tiles that can be used in a bathroom. They may work best in a master bathroom where you have a seating area. There is nothing nicer than stepping out of the bath or shower onto a heated floor, especially in the colder months. A modern bathroom design will usually incorporate a heated floor in the bathroom. Radiant heat warms the floor from underneath. Using it just in the bathroom is economical. It works using a timer and a thermostat. Nobody wants to spend scads of time cleaning the bathroom. Sealed porcelain and ceramic tiles are the easiest to maintain, while natural stone is porous, so dirt and grime clings to it easier. Glass tiles make terrific accent pieces, but are very slippery, so they are not practical for floors. Larger tiles are gaining popularity for bathrooms, but don’t always look right in smaller spaces. Large pieces can be used in larger areas and the same tiling can be cut to be used in smaller sections. For instance, 12” by 24” tiles can be used on a floor, and when cut down to about 2” by 2”, can be used in smaller areas, perhaps in corners or even on sections of the walls.